The world's leading brands are so recognizable because they're totally consistent across all aspects of the logo, fonts, colours, and images making them instantly recognizable, bringing us a clear sense of meaning, reliability and security. An effective brand style guide takes your corporate mission, vision and values and translates them into design rules and informs the marketing team exactly how to communicate your brand. Your brand style guide should serve as the ultimate reference guide for any agency, freelancer or designer working with your brand, as well as making it easy-to-understand advice for internal staff. Your brand style guide should go beyond the traditional designer-driven brand style guide and establish an overall framework for use and interpretation of your core brand principles, the heart of your brand, while also enabling the agility to evolve with the times, and embrace new channels, and marketing strategies. This is the foundation of the Inbound brand, and the development of an Inbound brand style guide is more evolved version of the traditional brand style guide. Developing a consistent brand starts with creating a brand style guide. This is a branding rule book that helps graphic designers, marketers, web developers, community managers, and even signage and product packaging departments all stay on the same page, how to use the brand in the same consistent way across a wide variety of media and channels, and still present a unified brand to all customers. A brand style guide therefore governs the composition, design, and general look-and-feel of a company's branding. Brand guidelines can dictate the content of a logo, blog, website, advertisement, and similar marketing collateral. A colour palette is a group of colours that help to design the overall brand. It guides every piece of visual content the brand creates. The colour palette can be as simple or as elaborate as you want, so long as your brand doesn't deviate from the colours you choose to include. A colour palette is a range of secondary colours that enables your brand to be flexible to fit in with multiple uses and can allow flexibility of your brand for future use. Similarly, don’t necessary confine your logo to your primary colour palette, consider when it could be used in monotone, reverse or in percentage tones, and how it would suit a totally new purpose. The colour palette has to be flexible and often evolves with secondary colours that might be 'on trend', current and contemporary. 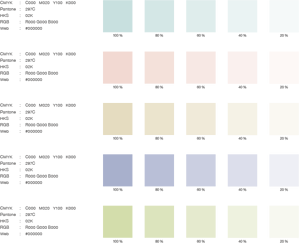 Some colour palettes that have a range of multiple colours often dedicate specific colours to specific types of marketing content. While the first two colours of your colour palette might govern your logo, for example, the next two colours might support your website design, social media usage and blog design. Another two or three colours might be the basis for all your printed sales and marketing collaterals. No matter what colours you use for your colour palette, make sure you identify their HEX or RGB colour codes. These codes consist of numbers and letters to help you recall the exact shade, brightness, contrast, and hue you want associated with your brand, so your colours don't gradually drift in appearance as you create new content. You can find colour codes using most photo-editing or design software that comes standard on your computer. A distinctive font for your logo and main graphic elements can be a major part of your brand identity. You must also consider how fonts used in representing your brand appear in other formats. Your brand style guide will always provide guidelines for the fonts to be used online as well as for other marketing uses. 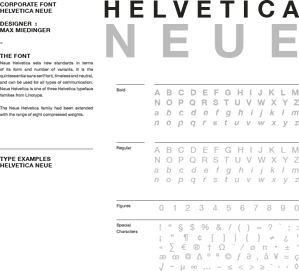 Typographic guidelines can support your website design, which font you use to publish articles, print, and even a tagline to go with your company logo. The purpose of the brand style guide is to form and maintain all of the various brand elements of a company that, when combined, spell out the entire brand as it's recognized. Include examples of the types of imagery that best reflect your brand – whether photographic, illustrated or digital. If your brand is based on retro images, consider allowing any black and white or sepia images – even if contemporary – when it’s more appropriate to a particular marketing or persona requirement. Use real-life examples of how your brand elements should be used. Your brand style guide should include visual examples with sample images of layouts for web pages, emails, ads, printed collateral and other relevant mediums. These enable everyone to understand just how you want your brand to be interpreted and portrayed. Now Take Your Style Guide To The Next Level With An Inbound Brand Style Guide? 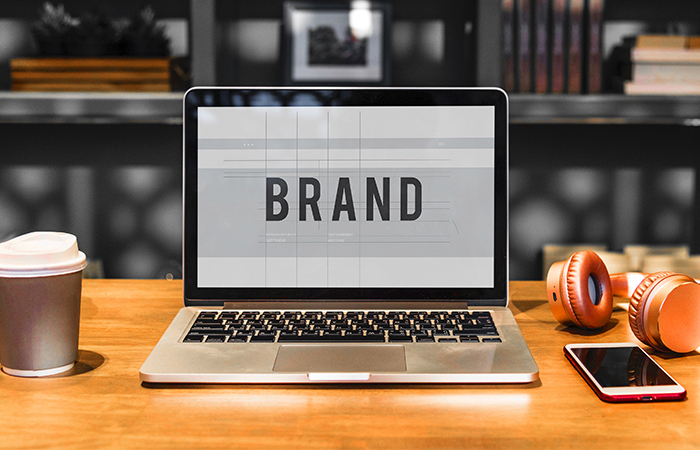 An Inbound brand style guide includes the intangibles and extra's that contribute to the brand - it adds the heart and passion of the brand to the style guide. The traditional brand style guide process doesn't adequately identify the heart and soul of the brand. As Inbound marketers, we communicate brands. Our goal is to influence the purchase of the brand and therefore other 'inbound' elements can be added to the brand style guide to create a more 360-degree view of the brand. Therefore, as Inbound marketers, we need to be mindful of providing an emotional response to the brand and then quickly provide the supporting evidence to justify the response. With Inbound we are creating a story that is so much bigger. It's the brand that the marketplace forms a connection to. To do this we have to explain the rationale and emotions behind your brand. This should cover how it reflects your company values and culture, and how the brand was designed to create the right impressions on your target markets. The heart of the brand is about an emotional connection, so make it clear what you want your audience to ‘feel’. How you ‘speak’ to your audience is an important aspect of your brand identity - the 'feeling' part. Knowing who your personas are, how they speak, where they hang out, and how your brand identity resonates with them, is all part of the equation. The more you know your persona - the better you can target your brand at them. It lets your customers know what to expect from your brand, building trust, giving them the impression that you know them all ready, so they'll feel comfortable interacting with your brand. Building trust is an important factor in brand communications. Your business's mission statement is a great compass for your Inbound brand style guide. A mission statement ensures every piece of content you create for your brand is working toward the same goal, and, ideally, strives to solve the same problem for your customer. Your belief set and values can be shared with your persona's so they can connect with. This the 'why' message - what you're trying to accomplish for the greater good. You can extend this further by adding your company culture code, you brand positioning, your value proposition, and your elevator pitch. All of this additional brand information, when added to your Inbound brand style guide, will add a very valuable description of who you are, what you do, where you are going, who you help and how you help them. This will set the tone for the rest of your Inbound brand style guide and I assure you this will be really valuable for anyone who needs to use the style guide - they will get it and respond with better quality work, helping the Inbound process to attract more qualified visitors, leads and close more sales. Your buyer persona is your target audience, and therefore this document stipulates how you will communicate to them. Your buyer persona is a fictional representation of your ideal customer and will help ensure that every member of your team knows who they are engaging with and, more importantly, how to engage with them successfully. While you can market and sell to every person you can find, chances are that won’t be a successful strategy. Not everyone wants what you are selling and you don’t want to spend wasted time and money try to attract the wrong person. By developing a buyer persona, you will be able to focus on your right type of customer and specifically target them. Most B2B organizations who do Inbound Marketing, have at least 3 to 5 primary buyer personas. By adding the buyer persona to the Inbound brand style guide, details related to your ideal customer's age, gender, job title, and professional challenges are all accessible in one place. Sharing this across your organization and making this part of your Inbound brand style guide will focus your brand targeting and inform and remind people who your key persona are. One last Inbound branding element we like to add to the Inbound branding style guide is an editorial style guide - the bread and butter of an authoritative brand. This component of your brand style guide can have strong implications for Inbound marketing and your PR team, as well as the people who write articles, scripts, blog posts, and website copy for your company. An editorial style guide's main job is to commit to an editorial stylebook (such as The Canadian Press Style Book, Associated Press or Chicago), how to phrase certain products, topics the brand can and cannot write about, and even other companies the brand can and cannot mention. It's like a writers playbook. We recommend you stick with one style as inevitably there are editorial style disputes that can be quickly resolved by looking up the answer in the appropriate guide. Your brand's editorial style guide can also go into much deeper detail about your buyer persona: what they like to read about, where they read it, their general reading level, etc. Your Inbound brand style guide must be clear and helpful to anyone referring to it. Just as your brand must adapt and evolve over time to meet your changing strategic marketing and tactical communications needs, the ideal style guide should instil consistency so your brand remains recognizable to your personas and in harmony with your overall organizational values and mission. THE BRIT AGENCY is a certified Gold Tier Hubspot Partner, a HubSpot COS certified Inbound Website Design Agency, a Shopify eCommerce Partner, and a certified "Google Badged Agency Partner". We have offices in Toronto and Barrie, Canada, and Salisbury, UK.